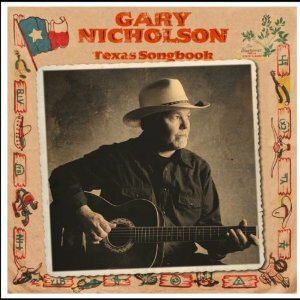 Although he left Texas for Nashville over 30 years ago, Nicholson remains a Texan at heart, and all 13 songs on Texas Songbook have a Texas connection. Produced by Gary and recorded in Austin at Asleep at the Wheel’s Bismeaux Records, the album features Texas musicians and co-writers, the latter group including the likes of Lee Roy Parnell, Delbert McClinton, Guy Clark and Allen Shamblin among others. There’s plenty of fiddle and steel guitar as well as effective use of the harmonica and accordion in this collection of swinging and two-stepping, dance hall and honky-tonk style music. Many country music fans may already be familiar with some of the songs on this album: “Fallin’ & Flyin’ “, written with the late Stephen Bruton and performed by Jeff Bridges, was featured in the movie “Crazy Heart.” The island flavored “Live, Laugh, Love” was written with Allen Shamblin and previously recorded by Clay Walker on his 1999 album of the same title. It’s a “seize the moment” song. The cool sounding “Messin’ with My Woman”, written with John Hadley and Seth Walker, is a swinging tune with attitude. “Don’t be messin’ with my woman, when I’m out on the road, let my song be your warning, you can’t say you ain’t been told.” If the guy does mess with his woman, he’s “gonna take a whole lot of doctors to put you back the way you were”, with background singers Ray Benson and Jason Roberts of Asleep at the Wheel chiming in “they’d never get it right, they’d never get it right”. With a swinging melody that I love, “She Feels Like Texas” was written with Kimmie Rhodes. The girl’s “in a lone star state of mind, everywhere she goes.” Whenever she sees a foreign tourist attraction, she compares it to something from Texas, including calling the Eiffel Tower “the biggest oil rig I believe I’ve ever seen”. “A Woman in Texas, A Woman in Tennessee” is a solo writing effort by Gary that he calls “a true story I made up”. Both women wondered where he was half the time. The situation gets more complicated as the song progresses: children with both, an accidental meeting of the families and the revelation of another family in Louisiana. “Bless ’em All”, written solely by Gary, bless him, features the gospel singing McCrary Sisters. Bless them too. The song mentions about a dozen religions, bless ’em all, and concludes that “we got to all come together and find a better way to live”. “Texas Ruby”, written with Jim Croce’s son AJ, features Marcia Ball on piano and Jim Hoke on saxophone. It tells of a stripper who gets on a street car in New Orleans on a real hot and sticky day and starts doing her thing. It’s a mildly amusing tune that AJ previously recorded in ’06 on his “Early On” cd. “Lone Star Blues” was written with Delbert McClinton and has been previously covered by Delbert & George Strait. In the first scenario, he signs up for the rodeo. “I drew a bull called original sin, heard he’d killed a couple of men”, … but “he got disqualified when the bull up and died”. The chorus and last two scenarios gave me the blues and should have died too. The chorus speaks of north, south, east and west Texas blues, together the Lone Star Blues. Although the songs included in “Texas Songbook” do not, for the most part, match some of Gary’s very best songs, the album as a whole is thoroughly enjoyable. The production is light throughout, the music is great and Gary knows how to deliver a song. If you’re into dancing, you’ll double your pleasure with this album. Thanks for the review. I enjoyed this album too. It has an easy sound to it. It sounds organic without being an acoustic album.